Until a little too recently, the word “salad” struck fear into my heart. It’s just so cold, leafy and usually bland, unless you add one of the things that defeats the purpose of eating a salad anyway, like cheese, egg, salad dressing, etc. Yes, I know it’s strange. And my co-workers at my previous job had a great time ragging on me about my feelings toward salad; now Edwin carries that torch! However, I look forward to the holidays because my mom likes to think outside the box when preparing a holiday salad. She spends some good time hunting through her massive collection of cookbooks for forgotten gems. My all-time favorite salads have been born on these occasions, and the salads usually contain fruit. 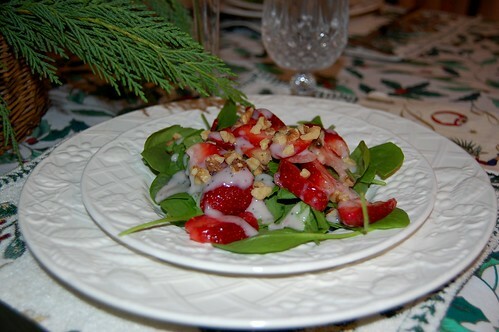 This past Christmas she made Strawberry Spinach Salad with Yogurt Poppy Seed Dressing. But it’s not just a Christmas salad or winter salad, it’s adaptable to any occasion and it’s easy to put together. 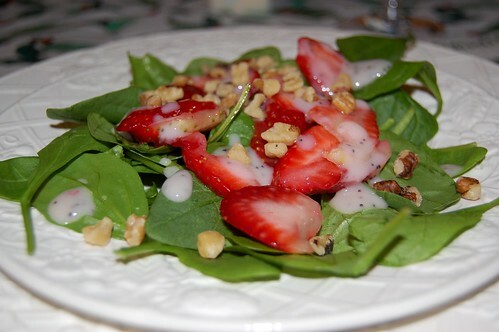 The combination of sweet strawberries on a bed of spinach leaves with a few crunchy walnuts tastes heavenly, and it looks bright and beautiful especially on a white plate. This recipe even enchanted a salad-phobe like myself! My mom also suggests another variation that she believes would work well – substituting the strawberries for blueberries and the strawberry yogurt for blueberry yogurt. In the version below, she swapped out the recipe’s suggestion of pecans for walnuts, a more heart-healthy nut (thus, dad-approved). I hope you enjoy this salad as much as I do. Don’t wait to try it out! In a large bowl, toss spinach, strawberries, and nuts. Combine dressing ingredients in a small bowl and add to a gravy boat, so that you can drizzle however much you like on individual plates. Serve chilled and enjoy!